Hawaiian Electric Company has been Oahu’s power company for as long as I can remember and I can remember Hawaii in July of 1960. Back then, Hawaii was going to stop using oil to generate electricity as soon as the population could justify a Nuclear Power Plant. Nuclear long ago lost its luster and now the magic bullet has become clean energy. Hawaiian Electric has been supporting all sorts of green alternates and has been saying whatever the local politicians wanted to hear. Political realities have trumped economic realities and the Hawaii public has been paying for it all with higher rates. Late last year Hawaiian Electric agreed to be purchased by NextEra Energy. I’d suspect NextEra saw what I noticed….a company that ignores the real world in favor of the political. NextEra says they like green energy, but they want all the subsidies eliminated. Locals are questioning whether the NextEra execs are being truly honest. The local papers are full of it. Solar power without adequate storage is not a viable solution for Hawaii’s energy problems for all the reasons I stated in my last post. Hawaii has an after sunset peak that must be met with oil based generation. Dirty nasty oil. Solar provides power when it isn’t needed and cannot provide it when needed…until better batteries are developed. Hawaii has been following the German model. Two complete energy systems, one renewable and one that uses fossil fuels operate side by side. 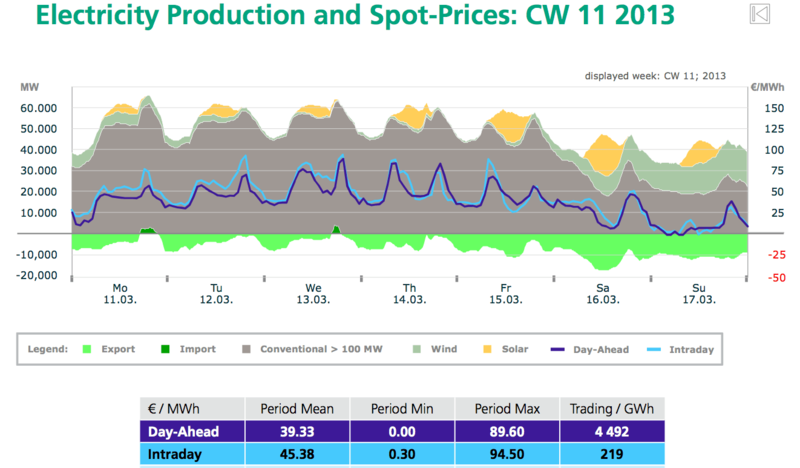 Germany has enough solar and wind to meet their peak when it is all working….but it never is all working at once. Wind and solar power cannot be relied upon, day in and day out. Utilities base load with other more reliable generation. Whenever the wind blows in Germany, they get more power than is needed. The utility is required by law to take it, which creates an energy imbalance. German Utilities sells the surplus to neighboring utilities, something Hawaii will not be able to do. The price of power at the German border moves around wildly. In January of 2013, and again in 2014, the utilities bought power from the wind providers and could not find willing buyers. They actually had to pay their neighbors to take the surplus power. Utilities are slowly and steadily destroying their balance sheets as they are forced to buy high and sell low. Too much solar power creates a similar problem for Hawaiian Electric. The utility is forced to limit the number of rooftop solar installations…and the locals don’t understand why. Too much power entering the system at unplanned places stresses the utility grid and provides no relief for peak demand. Because the utility takes power when it isn’t needed and gives it back on peak, it is essentially buying high and selling low. The utility is forced to maintain the old system and counts on it at peak, but there is less total generation using the grid. Peak demand continues to rise, which forces additional investment from the utility. Costs go up but the revenue base fails to keep up as off peak demand actually goes down. Throw in generous state tax credits for solar installations and you have a recipe for economic disaster if you are a power provider. The new system doesn’t provide any peak assistance and yet it is heavily subsidized by everyone in Hawaii. And since the utility and the State have not been particularly forthcoming about the negatives associated with green energy, the public doesn’t understand. Unreasonable expectations are everywhere. It looks like NextEra is going to try to finesse this problem by sounding positive on green energy but really being less positive than Hawaiian Electric has been. Neither utility’s position is particularly truthful, but NextEra’s approach understands the economics of power generation. I wonder though. Island politics are tricky. Perhaps Hawaiian Electric was right to stick their head in the sand and pretend the problems didn’t exist. Hawaii’s politicians might simply shoot the messenger. Time will tell. Anyone who has followed this blog for a while will not be surprised to learn that Electric Car stupidity is alive and well in Honolulu. Hawaii’s government officials have put on their rose colored green energy glasses. The rosy view sees a warm sunny climate that has excellent solar properties, and short driving distances. Hawaii has been anointed by local government officials as a paradise perfectly set up for Electric Vehicles. Hawaii has an elaborate subsidy system to encourage energy conservation and to encourage renewable energy. Very nearly all green energy in Hawaii is solar based, either in the form of solar water heaters or solar electric panels on the roofs of houses. There is a bit of wind and lots of other things are being tried, but most electricity in Hawaii is produced by burning oil based fuels. Remove the rosy hue and reality must one day set in. Absent a dramatic change in battery technology, all intermittent green energy options will continue to be of limited use. A better battery is an absolute necessity. Today’s crop of batteries are not up to the task. Hawaii’s politicians appear to be wishing for a world that does not yet exist. And wishing it were so is usually bad public policy. Hawaii is executing policy based upon a technology that doesn’t yet exist. The current crop of batteries are both expensive to manufacture and pollute the world when spent. Solar panels only work for about 5 hours per day and wind averages about 8 hours a day. Both are predictably unreliable. That unpredictable nature will persist until battery technology improves. Electric vehicles (EV) are exempt from parking fees. Generous tax credits provide purchase assistance and businesses are given subsidies to compensate for mandatory installation of electric fuel fuel stations at parking facilities where 100 or more vehicles are parked. Hawaiian Electric offers discounted electric rates for EV. And Taxi’s have been given generous incentives too. Solar power does reduce the need for oil power when it is sunny. People install more solar than they need. The excess is dumped onto the power grid. Hawaiian Electric is forced to take it. The excess power is then retrieved from the grid during the evening peak. This activity destabilizes the grid, making the entire system less reliable and it also shifts costs from those that have solar to those that don’t as everybody else has to pay more for peak energy. A well healed homeowner can install solar power panels and buy an electric car. Hawaii pays him to install the solar, then pays him again to buy the car and allows a discount on the electrical power used while allowing free parking where ever he goes. What a deal….if you own a home and can afford a new car. Most car charging is done at home at night. The Hawaiian Electric power grid peaks shortly after sunset. Both wind and solar are most effective during the day. Hawaiian Electric is required to provide power 24/7. Very nearly all power generation after sunset in Hawaii is done via oil fired power plants. EV’s in Hawaii use one form of oil (electricity) instead of another form of oil (gasoline). Oil is a very dirty and very expensive way to produce power. Hawaii is the only state in the USA to use oil widely in power generation. Modern gasoline cars pollute less than not so modern oil fired power plants. EV’s in Hawaii produce twice the air pollution and twice the carbon dioxide as an equivalent gasoline vehicle, particularly newer gasoline vehicles that get significantly better gas mileage. Hawaii’s government has provided subsidies for all sort of non oil based products. Biodiesel and ethanol are being encouraged with generous subsidies. Hawaii’s ability to produce either is extremely limited. Both ethanol and biodiesel require large tracts of agricultural land. Land is something in short supply in Hawaii. Hawaii has to import most food items because they don’t have enough farm land. Sugar cane, a primary ethanol feedstock, is going away as houses fill up available land. When I was a small boy, sugarcane was everywhere in rural Oahu. Not anymore. Hawaii’s approach is to try a bit of everything and hope that something will work. The result is lots of subsidies to encourage less electrical usage. People get government assistance to put LED lighting in their homes, to use more efficient appliances, to install solar water heaters, and tax credits for solar powered electricity. And one subsidy that encourages more electrical use…Electric Vehicle tax credits and deals. And who pays for it, everybody that doesn’t drive an EV and have solar electric panels on their house. Hawaiian Electric customers pay three times the national average for their electricity, which makes conservation an obvious choice. It also makes Electric Vehicles more expensive to drive. Hawaii’s air is dirtier and its electricity costs more because of a misplaced love affair with Electric Vehicles. If and when a better battery becomes available, the state can force solar power generators to store their own power and use it during the evening peak. If battery technology improves and if the State adopts reasonable solar panel policies many of my objections will disappear….but until then…. Shortly after Al Gore’s film was released, I had a discussion with my brother. We were talking global climate change. It was not our typical agree to disagree discussion. I was presumed to be wrong, horribly wrong. Global disaster was coming and coming soon. And then I asked him the difficult question. Where do you stand on Nuclear Power? He could not, or more accurately, would not answer the question. Therein lies the problem. Increased Nuclear Power is absolutely necessary if the UN’s Intergovernmental Panel on Climate Change (IPCC) is correct in their recently leaked gloomy predictions of world climate. There is no solution that will work right now that does not include increased use of Nuclear Power. Germany has been leading the charge into a renewable world. Let’s try to learn something from their experience. Germany has embraced solar and wind with some interesting consequences. Despite it’s northern location, Germany is the largest solar power market in the world. And it has a significant amount of wind power too. Today, Germany has 35 gigawatts of installed solar and 32 gigawatts of installed wind. On any given day they need about 70 gigawatts of power. Sounds promising. Germany gets less power from wind and solar than you might expect. I know I was surprised. Solar produces about 5.3% of the total, wind a bit over 8%. Wow. Germany has a system that takes the renewable energy when it’s available. It’s base load plants (mostly coal and nuclear) cannot be easily started and stopped. The result is surplus power that is exported (bright green) to other countries in Europe. On December 31, 2012 something a bit odd happened. Lots of wind on a day when not much power was needed. German utilities had to pay people in other countries to take their excess power! Notice how the price of energy in the wholesale market (blue) fluctuates. March 17, 2013 had a few hours during the day where half the power being generated was from renewable energy. Once again, as the wind came up, wholesale prices for power went down. The utility pays a fixed rate for the power and must take it under Germany’s system. German utilities are going broke. Lots of wind on Saturday, none on Wednesday. Throw in a bit of cloudy weather and nearly no power is generated by renewable energy (Wednesday March 13). The utility has to provide power all day every day. And the only way that can be done without carbon dioxide emissions is with Nuclear Energy. Every northern climate in the world faces the same problem. German utilities must provide service when neither wind nor solar is available which happens to be most of the time. They in effect must build 100% redundant power systems. Germany is walking away from Nuclear power. They are closing old plants and not replacing them. The 2011 disaster in Japan has them running scared. They fear Nuclear Power more than they fear global climate change. Germany talks tough on climate change, but do they really believe? I’ve been struggling for a long time with the Obama Administration Energy and/or Environmental Policies. I am particularly puzzled by their reluctance to embrace natural gas. Today I think I finally figured out what is going on…and admittedly I’m a slow study….but I think I’ve got it. The bureaucrats that advise the President are environmental dreamers. Dreamers live in the world they would like to have, the rest of us are stuck in the real world. In the dreamers world…we have lots of renewable energy… and we have a way to store the energy. Storage that is both economical and efficient would be nice. Too bad it doesn’t exist. When it does exist, all sorts of wonderful things become possible. But until then, there is one truth that cannot be denied, utilities cannot use renewable energy to meet their demand requirements because it is not reliable (except for hydro, which works because it has storage in the form of water behind the dam). The average solar panel works about 5 hours a day, the average windmill 7 or 8. What is a utility to do the rest of the time? Power utilities must choose between three available choices, coal, natural gas and nuclear. There are no other currently available choices. Of those, one is a clear loser… with current technology…coal. And the Obama administration has figured that out. There are two choices left….and the residents at 1600 Pennsylvania Avenue refuse to make a choice. I like both choices, but since I live in the real world I know that Nuclear is not a political reality. This leaves natural gas. This is not a difficult choice. Support widespread use of natural gas. Sure it’s a fossil fuel, but it’s the good one. It burns relatively cleanly. Sure natural gas produces some carbon dioxide, but it produces about half as much as oil or coal and is clean burning (no cancer causing air pollutants). And it’s cheap. Therein lies the problem….a cheap clean burning fuel reduces the need for renewable energy. And according to the dreamers at the White House, that is not a good thing. Renewable energy good…fossil fuels bad….in the fantasy world surrounding the White House. When a cheap battery becomes available, the economics of solar power and wind turbines will dramatically improve…..but while we wait…..let’s produce lots of natural gas. Nuclear power presents an interesting group of problems for people trying to resolve their carbon dioxide/electrical power generation problem. The world needs electricity. Cheap electricity dramatically improves the quality of life for people living in poor countries. Green Power is expensive. Environmental groups like carbon taxes, which don’t make green power cheap, it simply makes alternate forms of power more expensive. Poor people all over the world are left without a choice. And green power is unreliable too. Nuclear power is economical and clean. Many global warming worriers have been advocates of some form of nuclear power. Unfortunately it can create serious environmental problems when mistakes are made and people will make mistakes. Wind mills and solar panels provide clean power but only when Mother Nature feels like providing the resource. Solar panels are both location and time specific, they only work in sunny places during daylight. Wind is only successful in windy locations and much of the USA is not suitable for wind (the white and tan areas of the chart below). It rains or snows and the wind blows 300+ days a year….and then there are 50 really bad days. The best places to build wind ….are also the worst places to build wind. Imagine wind farms in the Aleutians or the mountains in Montana or in the middle of Lake Michigan. All have high installation costs, their own environmental problems and are a great distance from power centers. Too many environmental groups like to make decisions based on the world they would like to have an not on the one we all share right now. Their green solutions for power use ignore the real world. Al Gore did this in his 2008 Op-Ed piece in the NY Times title The Climate for Change. Mr. Gore’s goal was carbon free power in 10 years. Today, 4 years later, we have not yet started down the path Mr. Gore advocated. Why? Because it was wildly impractical, and politically and financially unrealistic. It ignored all the problems are a part of any carbon free solution…including Nuclear Power. The electric power system we have right now needs reliable power. What we call in the trade base load power. Wind and Solar will not work as base load….and saying they will doesn’t make it so. Suppose you live in Atlanta, what are your choices? Solar is probably you best renewable choice….when the sun is shining. The average solar panel works about 4 to 5 hours per day and are much more efficient in the summer than in the winter. It will help with the summer AC peak, but be of little use in winter. It is the most expensive source of power widely available. What are you going to do the other 20 hours of each day? I suppose one could build solar all over the country to increase the time covered. Unfortunately, the USA is only 4 time zones wide, so there is going to be 16 hours a day, every day, when solar won’t work. Wind, hydro and geothermal also have the same siting difficulty. Good locations are far, far away. That means transmission lines, lots of transmission lines and lots more wind turbines in many different locations to cover for the variability of wind production patterns. And we still need a backup power plant for the dark, windless nights in winter. Electricity is an on demand system, you turn on your light switch, the electric company provides the juice. There is no storage (except for hydro). The power must be available at all times. The only electrical source….available in large quantities right now….that is carbon free…..is Nuclear Power. NOW for the test, do you fear carbon emissions more or less than the risks Nuclear Power presents. A single event on March 11, 2011 changed many minds. A tsunami hit the Fukashima Nuclear Power Plant in Japan and nuclear power lost much of its luster. Despite the wishes of the green community, power plants will need reliable base load of some kind. So what’s it going to be? The choices are 1) coal, 2) natural gas or 3) nuclear power. These are the only choices available right now. No fair choosing something that doesn’t exist. Hmmm. Natural gas….but that’s for another post.